If you are an individual or group looking to give knitted items to a good cause then have a look at our Projects and Patterns page where you’ll find a range of free patterns to use. You can use any pattern you would like and knit any item you fancy. Make sure you subscribe to our newsletter and blog to keep up to date with our latest projects and campaigns, or find us on Facebook and Twitter for more regular updates. Have you got any spare needles, yarn or other knitting related paraphernalia? We are always on the look out for these as we can then use them in our work with marginalised sections of society, for example in prisons, to help set up new groups and keep the needles clacking! We particularly need warm adult clothes, bed socks, scarves, adult hats and of course large sized blankets. We are delighted for anything you send and can always find people who need them. We are also very happy to take crocheted items. We can only accept new, unworn, ‘hand-made’ (ie not shop bought) items. We currently have a lot of small and premature baby items, so please avoid sending those for the time-being. Got any burning questions? Please check out our Knit for Peace F.A.Q. here. Looking for your next project? Check out our free patterns here or take a peek at the offerings in our shop here. It costs a lot to acknowledge, sort and dispatch the donated knitting. We have to rely on donations. We estimate that we are sending £5,000,000 worth of goods each year. 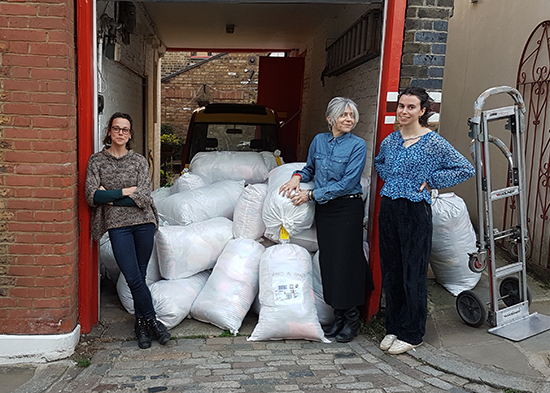 We realise that our knitters (we calculate now over 20,000 in the UK) are generous in making and delivering their knitting and we truly appreciate it. If you can spare any funds to help us with the costs of Knit for Peace, it would help even more. Click the button below to donate, perhaps even setting up a monthly donation of a few pounds to help support our work! Many thanks. If you are a UK taxpayer please consider gift aiding your donation. Click here for a form and more information.